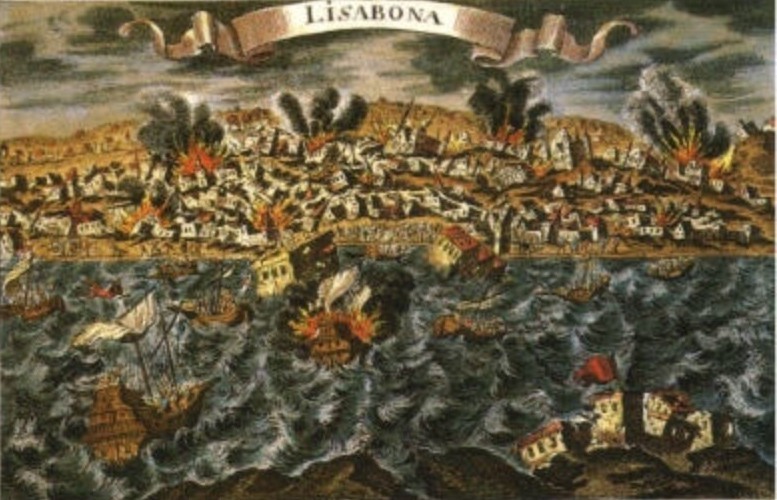 This painting shows Lisbon, Portugal, during the severe earthquake of 1 November 1755 as seen from across the Tagus River. The city in ruins and in flames. The earthquake caused a tsunami, the painting shows the highly disturbed water in the harbor, which sank many ships. The earthquake and its consequences potentially caused the deaths of up to 100,000 people. Click here to view source. The shifting of tectonic plates, for instance, may not be absolutely predictable, but from a geological point of view it is ‘normal.’ The vast majority of these shifts go unnoticed, and no geologist would think of labeling them a catastrophe. In other cases, nature may supply the trigger for a disaster, but whether we call a natural occurrence a catastrophe depends largely on our perception of its impact on humans. Extreme natural events happen all the time, such as storms, earthquakes, droughts, or landslides for instance, but they only become disasters if they affect inhabited areas and if they meet populations that are unprepared for them. This new Arcadia collection will present interesting environmental histories from around the world that address disasters in the past and present. Some existing Arcadia articles in this collection are about epidemics, accidents in nuclear power plants, and floods, but this “Disaster Histories” collection is open to new contributions. The collection is curated by Katrin Kleemann (Rachel Carson Center for Environment and Society). Information on how to contribute.